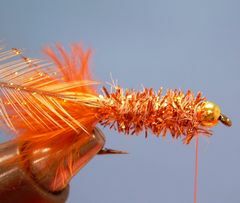 The Chili Pepper is the best producing fly ever used by Tony Spezio. It performs well on all species of trout, panfish, and black bass. 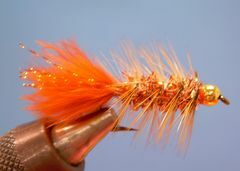 It's also a great fly for carp and redfish. Weight Lead Wire .020 dia. The original Chili Pepper was tied for me by a fishing companion after I told him that I didn't like to fish Woolly Buggers for trout. The fly was tied as a joke. It didn't even have a name. I put it in my fly box and forgot about it. Some time later my buddy and a I were trout fishing on the White River. 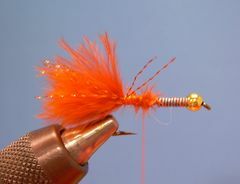 I wasn't having much luck and my friend suggested that I try the silly looking orange streamer that he had given to me earlier in the season. I dug around in my fly box and found it. I tied it on and on the first cast I took a nice brown trout. On the next twelve casts I caught twelve rainbow and brown trout. The fly broke off on the thirteenth fish. I shared the successful pattern with members of our local fly fishing club and many begain to have great success with it. One guy said it was hotter than a Chili Pepper and that's how the fly got its name. 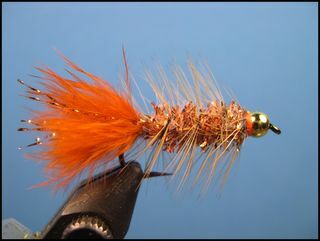 The homely little orange streamer that was originally tied as a joke is the most productive fly I have ever used for a variety of species of fish in cold, warm, and salt water. Fish the Chili Pepper just like you would a Wooly Bugger. It's hard to fish it wrong. 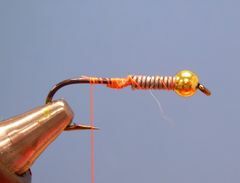 Crimp the hook's barb and place the bead on the hook with the small hole in the bead facing the hook's eye. Place six to eight wraps of lead wire directly behind the bead and push the wire into the opening in the bead. Attach the tying thread at the base of the bead and lay down a thread base back to the hook's bend. Strip fibers from a marabou plume and tie in from the base of the lead wire to the hook's bend. Pinch off the fibers so that the tail is fairly short. Save those fibers for the next step. Tie in the "pinched off" marabou directly on top of the tail to make a thicker and fuller tail. The tail should be fairly short. About two-third's the length of the hook. Next, tie in a few strands of Krystal Flash on each side of the tail. Tie in hackle with dull side facing you at the base of the tail and move the thread to the base of the lead wire. Tie down the chenille from the base of the lead wire back to the point where the hackle was tied in and then move the thread back to the bead and half-hitch the thread. Wrap the chenille forward to the bead, bind it down and remove any excess chenille. 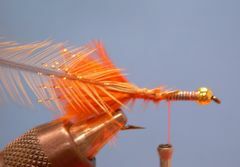 Take four or five turns of the hackle toward the bead and bind it down. Remove excess hackle. 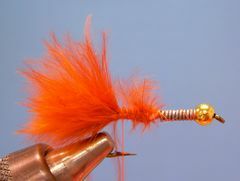 Build up an orange collar with the thread behind the bead and make a couple half-hitches or a whip finish to tie it off. Clip the thread and the Chili Pepper is ready to fish.